Recently a number of articles have been posted all reporting on a new set of experiments that attempt to shed light on one of the most fundamental postulates of quantum physics: the apparent contradictory nature of physical essence. Is ‘stuff’ a Wave or a Particle? Or is it both at the same time? Or even more perplexing (and apparently validated by a number of experiments, including this most recent one): the very observation of the essence determines whether it manifests as a wave or a particle. If you are not immediately familiar with the duality paradox of objects in quantum physics (the so-called wave/particle paradox) – then I’ll share here a very brief introduction, followed by some links to articles that are well worth reading before continuing with this post, as the basic premise and current theories really will help you understand the further comments and alternate theory that I will offer. The authors of these referenced articles are much smarter than me on the details and mathematics of quantum physics – and yet do not (in these articles) use high mathematics, etc – I found the presentations clear and easy to comprehend. Essentially back when the physics of very small things was being explored by the great minds of Einstein, Neils Bohr, Werner Heisenberg and others various properties of matter were derived. One of the principles of quantum mechanics – the so-called ‘Heisenberg Uncertainty Principle’ (after Heisenberg who first introduced this theory in 1927) – is that you cannot know precisely both the position and the momentum of any given particle at the same time. The more precisely you know one property (say, position) the less precisely can you know the other property (in this case, momentum). In our everyday macro world, we “know” that a policeman can know both our position (300 meters past the intersection of Grand Ave. and 3rd St.) and our momentum (87 km/h) when his radar gun observed us in a 60km/h zone… and as much as we may not like the result, we understand and believe the science behind it. In the very, very small world of quantum objects (where an atom is a really big thing…) things do not behave as one would think. The Uncertainty Principle is the beginning of ‘strangeness’, and it only gets weirder from there. As the further study of quantum mechanics, quantum physics and other areas of subatomic knowledge grew, scientists began to understand that matter apparently could behave as either a wave or a particle. This is like saying that a bit of matter could be either a stream of water or a piece of ice – at the same time! And if this does not stretch your mental process into enough of a knot… the mathematics proves that everything (all matter in the known universe) actually possesses this property of “superposition” [the wave/particle duality] and that the act of observing the object is what determines whether the bit of matter ‘becomes’ a wave or a particle. John Wheeler, in 1978 with his now-famous “delayed choice” thought experiment [Gedankenexperiment], first proposed the concept of using a double-slit test on a quantum object. Essentially you fire a quantum object (a tiny bit of matter) at two parallel slits in a solid panel. If the object is a particle (like a ball of ice) then it can only go through one slit or the other – it can’t stay a particle and go through both at the same time. If however the quantum object is a wave (such as a light wave) then it can go through both slits at the same time. Observation of the result tells us whether the quantum object was a wave or particle. How? If the object was a wave, then we will see an interference pattern on the other side of the slit (since the wave, passing through both slits, will recombine on the other side of the slits and exhibit areas of ‘interference’ – where some of the wave combines positively and some combines destructively – these alternating ‘crests and valleys’ are easily recognized. However, if the quantum object is a particle then no interference will be observed, as the object could only pass through one slit. Here’s the kicker: assume that we can open or close one of the slits very quickly – AFTER the quantum object (say a photon) has been fired at the slits. This is part of the ‘observation’. 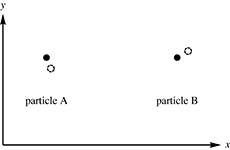 What if the decision to open or close one of the slits is made after the particle has committed to passing through either one slit or the other (as a particle) – and let’s say that initially (when the photon was fired) only one slit was open – but that subsequently we opened the other slit. If the particle was ‘really’ a particle then we should see no interference pattern – the expected behavior. 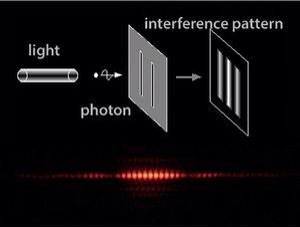 But… the weirdness of quantum physics says that if we open the second slit (thereby setting up the stage to observe ‘double slit interference’) – that is exactly what we will observe! And this is precisely what Alain Aspect and his colleagues proved experimentally in 2007 (in France). These experiments were performed with photons. The most recent experiments proved for the first time that the wave/particle duality applies to massive objects such as entire atoms (remember in the quantum world an atom is really, really huge). Andrew Truscott (with colleagues at the Australian National University in late 2014) repeated the same experiment in principle but with helium atoms. (They whacked the atoms with laser pulses instead of feeding them through slits but the same principle of ‘single vs double slit’ testing/observation was valid). To be clear, this “observation” is not necessarily human observation (indeed it’s a bit hard to see atoms with a human eyeball..) but rather the ‘entanglement’ [to use the precise physics term] between the object under observation and the surrounding elements. For instance, the presence of one slit or two – in the above experiment – IS the ‘measurement’. Now, back to the ‘paradox’ or ‘conundrum’ of the wave/particle duality. If we try – as a thought experiment – to understand what is happening, there are really only two possible conclusions: either a chunk of matter (a quantum object) is two things at once; or there is some unknown communications mechanism which would allow messaging at speeds faster than the speed of light (which would violate all current laws of physics). To explain this: one possibility is that the object, after passing through one slit somehow tells the original object “Hey, I got through the experiment by going through only one slit, so I must be a particle, so please behave like a particle when you approach the slits…” Until recently, the only other possibility was this vexing ‘duality’ where the best scientists could come up with was that quantum objects appeared to behave as waves… unless you looked at them and then they behaved like particles! A few years ago another wizard scientist (in this case a chemist looking at quantum mechanics to better understand really what goes on with chemical reactions) [Prof. Bill Poirier at Texs Tech] came up with a new theory: that of Many Interacting Worlds (MIW). Instead of having to believe that things were two things at once, or apparently communicated over great distances at speeds faster than light; Prof. Poirier postulated that very small particles from other universes ‘seep through’ into our and interact with our own universe. Now before you think that I, and these other esteemed scientists, have gone off the deep end completely – exhaustive peer review and many recalculations of the mathematics have proven that his theory does not violate ANY current laws of quantum mechanics, physics or general relativity. There is no ‘fuzziness’ in his theory: the apparent ‘indeterminate’ position (as observed in our world) of a particle is actually the observed phenomena of the interaction between an ‘our world’ particle and an ‘other world’ particle. Essentially Poirier is theorizing exactly what mystics have been telling us for a very long time: that there are parallel universes! Now, to be accurate, we are not completely certain (how can we be in what we now know is an Uncertain World) that this theory is the only correct one. All that has been proven at this point is that the MIW theory is at least as valid as the more well-established “wave/particle duality” theory. Now, to clarify the “parallel universe” theory with a diagram: The black dots are little quantum particles in our universe, the white dots are similar particles in a parallel universe. [Remember at the quantum level of the infinitesimally small there is mostly empty space, so there is no issue with little things ‘seeping in’ from an alternate universe] These particles are in slightly different positions (notice the separations between the black dot and white dot). It’s this ‘positional uncertainty’ caused by the presence of particles from two universes very close to each other that is the root of the apparent inability to measure the position and momentum exactly in our universe. Ok, time for a short break before your brain explodes into several alternate universes… Below is a list of the links to the theories and articles discussed so far. I encourage a brief internet diversion – each of these is informative and even if not fully grasped the bones of the matter will be helpful in understanding what follows. Do atoms going through double slit know they are being observed? Future events determine what happens in the past??? What I’d like to introduce is an alternate (or perhaps as an extension to) Prof. Poirier’s theory of parallel universes – which BTW I have no issue with, but I don’t think it necessarily explains all the issues surrounding the current ‘wave/particle duality’. In the MIW (Many Interacting Worlds) notion, the property that is commingled with our universe is “position” – and yet there is the equally important property of “momentum” that should be considered. If the property of Position is no longer sacred, should not Momentum be more thoroughly investigated? A discussion on momentum will also provide some interesting insight on some of the vexing issues that Einstein first brought to our attention: the idea of time, the theory of ‘space-time’ as a construct, and the mathematical knowledge that ‘time’ can run forwards or backwards – intimating that time travel is possible. However, in the wacky and weird world of quantum mechanics all quantum objects always have both position and momentum. As discussed already, we can’t accurately know both at the same time – but that does not mean the properties don’t exist with precise values. The new theory mentioned above (the Many Interacting Worlds) is primarily concerned with ‘alternate universe particles’ interacting, or entangling, in the spatial domain (position) with particles in our universe. What happens if we look at this same idea – but from a ‘momentum’ point of view? Firstly, we need to better understand the concept of time vs. momentum. Time is totally a human construct – that actually does not exist at the quantum level! And, if one carefully thinks about it, even at the macroscopic level time is an artifice, not a reality. There is only now. Again, philosophers and mystics have been trying to tell us this for a very long time. If you look deep into a watch what you will see is the potential energy of a spring, through gears and cogwheels, causing movement of some bits of metal. That’s all. The watch has no concept of ‘time’. Even a digital watch is really the same: a little crystal is vibrating due to battery power, and some small integrated circuits are counting the vibrations and moving a dial or blinking numbers. Again, nothing more than a physical expression of momentum in an ordered way. What we humans extrapolate from that: the concept of time; past; future – is arbitrary and related only to our internal subjective understanding of things. Let’s assume for a moment that the black and white dots represent slight changes in momentum rather than position. This raises several interesting possibilities: 1) that an alternate universe, identical in EVERY respect to ours – except that with a slightly different momentum things would be occurring either slightly ahead (‘in the future’) or slightly behind (‘in the past’); or 2) that our own universe exists in multiple momentum states at the same time – with only ‘observation’ deciding which version we experience. One of the things that this could explain is the seemingly bizarre ability of some to ‘predict the future’, or to ‘see into the past’. If these ‘alternate’ universes (based on momentum) actually exist, then it is not all that hard to accept that some could observe them, in addition to the one where we most all commonly hang out. Since most of quantum theory is based around probability, it appears likely that the highest probability observable ‘alternate momentum’ events will be one that are closely related in the value of momentum to the particle that is currently under observation in our universe. But that does not preclude the possibility of observation of particles that are much more removed, in terms of momentum (i.e. potentially further in the past or future). I personally do not posses the knowledge of the high mathematics necessary to prove this to the same degree that Bill Poirier and other scientists have done with the positional theorems – but invite that exercise if anyone has such skills. As a thought experiment, it seems as valid as anything else that has been proposed to date. So now, as was so eloquently said at the end of each episode of the “Twilight Zone”: we now return you to your regular program and station. Only perhaps slightly more confused… but also with some cracks in the rigid worldview of macroscopic explanations.